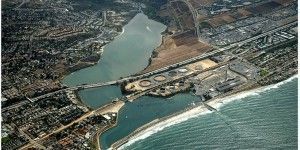 California has begun its biggest foray into desalination. Located in Carlsbad, in the San Diego area, the plant has raised hopes for drought relief — but has brought elevated stakes along with it. “The billion-dollar project is only the nation’s second major seawater plant,” noted the Associated Press. “The first U.S. foray in Tampa Bay is widely considered a flop.” That plant, a decade in the making, lost financing and couldn’t pass performance tests, the AP added. Its capacity was only half that of the Carlsbad plant, expected to churn out 50 million gallons of drinking water every day. To avoid a Tampa-style debacle, the San Diego County Water Authority brought in Poseidon Resources, a premier developer that agreed to shoulder some financial risk in exchange for a sizable investment return, including performance-based incentives. But Poseidon’s labors have so far come at a substantial cost. The plant “will cost $1 billion to construct over the course of the next few years and operational costs will remain high due to its energy consumption,” wrote Morgan Stanley advisor Larry Palmer in the San Gabriel Valley Tribune. And Poseidon has already faced major obstacles to building on its success in Carlsbad. For over a decade, the company has labored to secure permission to construct a plant in Huntington Beach, where surfers, beachgoers and environmentalists have pushed hard to fend off desalination. “After nine hours’ worth of public comments, many of which came from supporters of environmental groups Surfrider Foundation and Orange County Coastkeeper, and facing an obviously un-winnable vote, Poseidon withdrew its coastal development permit application” in November 2013, as the OC Weekly noted. Clashes have repeatedly broken out around the significant alterations to marine life that the Huntington Beach plant would impose. But the debate over the right approach has been mired in uncertainty. It’s “unclear which method of bringing in seawater — open-ocean through an existing pipe or subsurface intake — is actually more environmentally friendly,” the Orange County Register recently observed. While a “subsurface intake would assuredly kill fewer fish and fish larvae that otherwise would get sucked into an open ocean pipe, even if the pipe had screens,” building the intake “would last five to seven years, depending on the construction method, and disturb 25 acres of ocean floor habitat. Plus, the subsurface intake would have to be cleaned — sand and sediment scraped off — every few years, re-disturbing the habitat for decades after construction was done,” the paper added. Although the biggest industry players have made the biggest headlines in desalination, several startups have also sought to make headway. Manoj Bhargava, famous for his 5-Hour Energy drink, has hatched plans to sell California cities “a desalination unit roughly the size of a flatbed truck that relies on a conventional power source to distill seawater into freshwater well beyond Environmental Protection Agency guidelines,” as Fortune reported.